He performs Sunday with Lyle Lovett. Should be a great time. John Hiatt. Photo by Jim Cryns. This could be the most intriguing if relatively unknown pairing in recent musical history. Here are two convention-shattering writers and performers with no qualms whatsoever about busting down those barriers. I’m talking about John Hiatt and Lyle Lovett, two “birds of a feather” about to land in Milwaukee. The Pabst Theater presents “An Acoustic Evening with Lyle Lovett and John Hiatt” this Sunday, October 18, at the Pabst Theater. They’re both offbeat and engage audiences with twisted and befuddling themes. 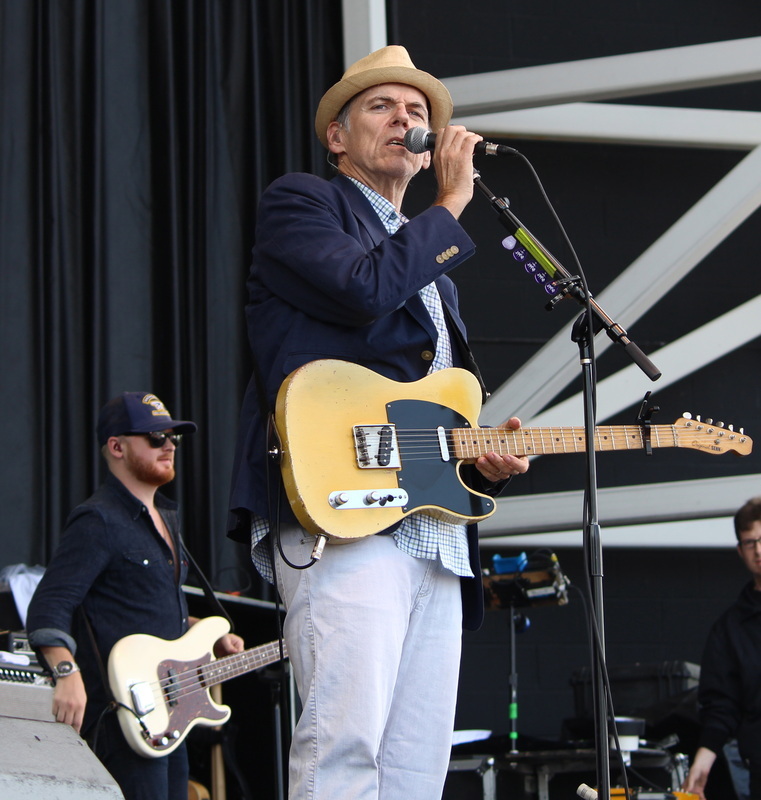 Not known for being heartthrobs, Hiatt and Lovett are all about the music. Hiatt looks like he could be Bing Crosby’s son, often sporting a fedora or some other funky hat you might wear on a fishing expedition. A Midwestern boy, Hiatt was born in Indianapolis and grew up listening to Elvis Presley and watching IndyCar racing. Hiatt is probably best known for writing “Thing Called Love,” a song Bonnie Raitt turned into pure gold. “Have a Little Faith In Me” is also his, along with “Memphis in the Meantime,” which has been covered by Carl Perkins and Greg Allman. Last summer he released Terms Of My Surrender, the latest of 24 albums. In 2008, Hiatt was inducted into the Nashville Songwriters Hall of Fame and won the Americana Music Association’s Lifetime Achievement Award. Lyle Lovett looks like Abraham Lincoln with a guitar. Which is all the more perplexing when you realize movie star Julia Roberts married him back in 1993. He was born in Klein Texas in 1957 and has recorded 13 albums and released 25 singles. Despite his being around forever, it’s a little more difficult to recall any hits from Lovett. He’s won four Grammy Awards, including best country Album in 1996, The Road to Ensenada. Lovett’s an educated guy with a degree in German and journalism. Lovett titles include “If I Had A Boat,” “Here I Am” and “An Acceptable Level Of Ecstasy.” Good songs, but not exactly cemented in our musical Rolodex. In addition to his musical prowess, Lovett has appeared in many films including The Player and Short Cuts. John Hiatt. “The Open Road” on Late Show With David Letterman. An Acoustic Evening with Lyle Lovett and John Hiatt, Sunday, October 18, Doors 6PM / Show 7:30PM, Pabst Theater. Nice stuff – makes me want to be there. Loved following up on these two musical giants. Cryns did a great job giving us a insights into their lives and music. Kudos! Great article! Can’t wait for the show. You paint such an incredible picture of what I can expect, Sunday can’t come soon enough!